Colin was born in Melbourne, Australia. When he was twelve years old he bought an old Maton acoustic guitar from a school friend and, from that time on, he has remained a singer-songwriter. 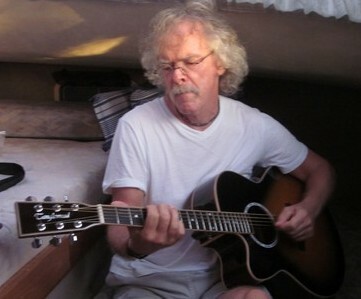 To fill the spaces in between his musical endeavours he followed a number of other pursuits, being a physicist, a teacher, an academic, a farmer, an aid worker, a boatbuilder, an editor, and a freelance writer. He has lived and worked in several countries, and has a few tertiary qualifications, including a PhD – his thesis centring on the development of certain types of mathematical models. He has also written three novels: The Tide Turners, The Holy Well, and The Boatbuilder’s Nose. Proud of his working-class roots – his father was a stevedore (or 'wharfie' in Australian parlance) and his mother a shop assistant – he had what he calls “a wonderful experience” in the now-defunct 'technical-school' system: “where you learned to make coffee tables rather than speak French”. 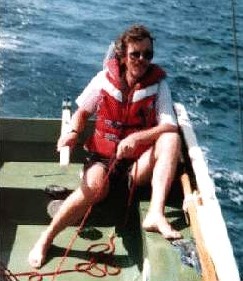 Although not for everyone, this early education seemed to be of great help in his wide-ranging adult pursuits, (the picture below shows him at the helm in one of the boats he built and sailed between islands in the Fiji group). Always concerned about the state of the planet and those who inhabit it, one of his early publications was a unique database and book package called Goodbye Forever? which provided information and learning activities – including unfinished songs – about threatened species of mammals. Also, as the foundation editor of Our World Too – a magazine for young people on the Pacific Island nation of Samoa – he focused on local and global environmental issues. equipment – a natural progression from when he and his wife and others started a hippy farming community “way back in time” (and where he played guitar and sang at a local establishment in order to pay for petrol for the tractor). As part of his popular-writing apprenticeship, he had many articles published in a variety of magazines and newspapers, the topics ranging from social commentary to technical 'how-to' pieces. His first novel, The Tide Turners, was published in 1999, and seemed to lead to a small following that was eagerly awaiting his next work. But it took some years ("I've been busy with other things"), for his second novel, The Holy Well, to appear, and then more before his third, The Boatbuilder’s Nose was published. That opportunity came in 2013 when, on a Greek island, Colin set up a tiny, makeshift studio in a friend's vacant apartment. Throughout the winter he wrote, refined, arranged, and recorded a series of original songs – not only singing the lead and playing the acoustic guitar, but also playing the accompanying instruments, and providing the backing vocals. “I had to, there was no-one else." He chose 16 songs to be mastered in the UK, and released them under his own name/label. The result was Out of Nowhere, an eclectic mix that iTunes decided to call ‘alternative folk’. “I’m reasonably happy with that description – but the range of my music is probably well outside its boarders." You can listen for yourself at CD Baby or Amazon MP3 or iTunes. 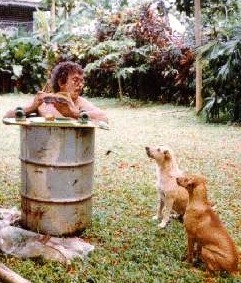 Finally, if you're wondering about the picture above, Colin was asked to supply something he thought would be appropriate; his comment was, "This is me cooling off in a rain-filled 44 gallon drum in Samoa. I'm reading to some friends who lived nearby. They seemed interested, so I wondered whether there might be a wider audience for my material".